Clad in navy blue scrubs and surgical masks, the team swarmed around the small brown dog, swabbing the pup’s belly and prepping it for the day’s procedure. 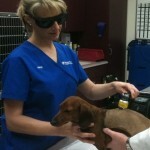 A camera in the University of Florida Small Animal Hospital operating room captured the activity. 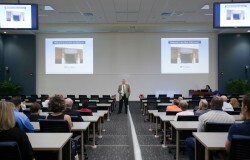 A few buildings away, a crowd gathered in the College of Veterinary Medicine’s new auditorium watched the scene unfold live in high-definition on a white-screen wall as wide as the lecture hall itself. The ability to videoconference in high-definition with operating rooms and lecture halls at UF and around the world is one of the key features of the new space, which College of Veterinary Medicine leaders officially unveiled Friday Aug. 18. 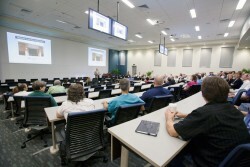 The new auditorium, located behind the Veterinary Academic Building, seats 161 and has everything needed to not only connect to a wider audience but also do so in the most technologically advanced way possible. The hall is equipped with three high-definition cameras, high-definition projectors, a sound system with flat panels embedded in the ceiling to capture not only what the lecturer says but also what students say and an expanse of white-screen wall large enough for three projections to appear at once. In addition, four large flat-screen monitors were placed toward the back of the room for folks sitting in the last rows. Lecturers can use a desktop computer or laptop to present their material and a document camera is in place in case they want to project a specimen. A tarantula helped demonstrate this capability to the crowd, crawling across a staff member’s hand as every fuzzy leg was projected in high-def glory on the vast white screen. 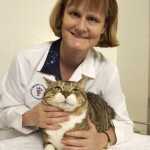 As the only veterinary school in Florida, class sizes will likely continue to expand in coming years and lectures remain the most efficient way to educate these students, an important fact in today’s economic climate, Hoffsis said. Currently, there are about 100 students in each class, and second-year students spend the bulk of their time in lecture halls. 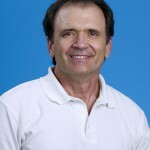 Aside from incorporating new technology, Hoffsis and other leaders also wanted the room to be comfortable for students. The lighting in the room is optimized for note-taking, wireless connections and outlets are available for laptops and the chairs were selected by this year’s sophomore class. In addition to the new Small Animal Hospital and auditorium, the college is also poised to begin construction of a new education center, remodeling its reading room into a place where students can meet and use the same technology found in the auditorium in small groups.